The quality of a JTAG/Boundary Scan systems is primarily defined by the performance and the architecture of its software. 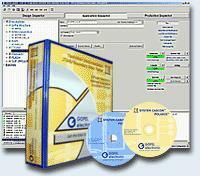 In 1991, GÖPEL electronic was the worldwide first vendor to introduce a specialised software technology in form of an Integrated JTAG/Boundary Scan Development Environment (IDE) - SYSTEM CASCON™ was born. The uniqueness of this JTAG/Boundary Scan Workbench has been maintained over the years through continuous integration of new, intelligent tools paired with innovative system extensions and improvements in the user interface. 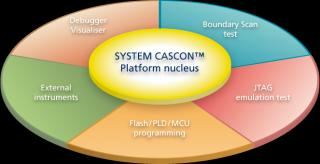 Today, SYSTEM CASCON™ is available in its fourth generation and is the only JTAG/Boundary Scan software that can claim the status of an open, graphical JTAG/Boundary Scan operating system. Its architecture thoroughly implements GÖPEL electronic's philosophy of Extended JTAG/Boundary Scan, eclipsing other solutions in regard of test coverage and system functionality by combining various test, programming and emulation methods with native JTAG/Boundary Scan procedures. More than 4,500 systems delivered attest for the market leading position of SYSTEM CASCON™. All logistics to automatically handle software updates and upgrades is available worldwide and 24/7 through our customer support website [GENESIS].